Preservation of capital is the most important investment consideration to retirement income investors. The right chart will quickly identify funds that preserve capital. Investors should avoid investment funds that were created since the crash. Retirement income investors must consider preservation of capital at every investment decision. Retirement income investors want to earn as much current income as possible from their savings. In the present economic environment the traditional safe retirement options like CDs provide very low yield. No one saw this change coming and as a result many retirees now find it difficult to earn the income they expected from their savings. It is no wonder that they may find themselves shopping for yield by running screens and reading articles about "Top Yielding Picks…". But the thing that must take precedent above all other considerations for retirees making investment decisions is to preserve the portfolio's capital for the lifetime of the investor or the investor and spouse. This must be the cornerstone of your personal financial risk management program. If you do not manage this risk, your portfolio and the income it can provide will probably shrink as the years go by. Performance information published about stocks and funds is reported on a total return basis that assumes reinvestment of all dividends. Retirement income investing is different because during retirement the investor takes out most or all of the dividends to use for income. For income investments the difference between the investment's total return and its price return without reinvested dividends is huge. Consider the following illustration. Chart 1 shows the total return for the Credit Suisse High Yield Bond Fund (NYSEMKT:DHY) during 2005 - 2014. The fund recovered fairly quickly from the crash in 2008 and produced a gain of 80%. An income investor who considered only the total return might be tempted to invest in DHY, which currently yields a juicy 11.8% paid in nice steady monthly dividends. Chart 2 adds a plot in blue for the performance of DHY if an investor purchased shares at the beginning of the period and did not reinvest any dividends. A $1000.00 investment in 2005 shrank to about $600 at the end of the period, a loss of 40%. The blue line in Chart 2 is a Price Chart. It shows the value of DHY without reinvested dividends. The price chart is the scorecard over the period for how well the underlying business strategy and management's execution preserved investor capital. Stockcharts.com offers free "Perf Charts" that plot the percentage change with or without reinvested dividends over a period of time. To produce a PerfChart, go to Stockcharts.com and select "PerfChart" from the dropdown at the top right side of the page under the caption "Start To Chart!" Entering the symbol plots the return with reinvested dividends (Total Return), while placing an underscore ("_") in front of the symbol plots the closing price without reinvested dividends (Price Chart). Multiple issues may be plotted on the same chart by separating the symbols with commas. As illustrated in Chart 2 income investments may shrink investors' capital while paying nice regular dividends. Financial regulation requires that shareholders be informed in writing when the fund distributes amounts from any source other than net income and this is reported in a Section 19(a) report. However, there are many ways that investors' capital can shrink without triggering disclosure of return of capital in a Section 19(a) report. Rising in market interest rates reduce the market value of many fixed income securities, as do rating downgrades, rumors, declining financial performance, natural disasters, technological developments, defaults and bankruptcies. Because of the wicked asymmetry of percentages, the figure of 40% understates the magnitude of the problem. A gain of 40% is not sufficient to restore the loss. The investor would need to gain 66.7% on the shrunken residue of his portfolio to recover the loss ($1000 / $600). You do not want to be casting around during your golden years trying to find a quick 67% gain for your retirement nest egg. This is why retirement income investors must consider capital preservation at every investment decision. The past 20 years have been unusually volatile for financial markets. In the 1990s we had the dot-com bubble, then the 9/11 attack and the subsequent financial market crash. Then we had the real estate finance bubble and the big crash in 2008 that marked the start of the Great Recession. 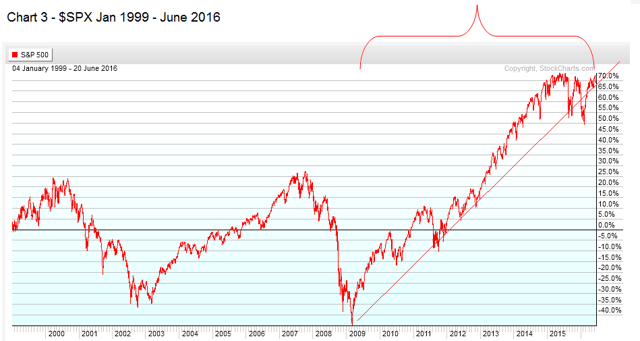 Since 2009 stocks have had a nice long recovery. At the bottom of the stock market crash of 2009, long time Wall Streeters knew it was either the beginning of a terrific opportunity or the end of the world as we knew it. A lot of new funds were created after the crash and rode the recovery up to produce impressive performance. The steady upward trend since 2009 has raised all boats, so to speak, and made it impossible to distinguish the investments that have a durable strategic advantage from those that merely rode the recovery and may not survive the next crash. For that reason retirement income investors need to take a long view when evaluating investment opportunities. I recommend that retirement investors only consider investments that existed before the 2008 crash. Retirement income investors need to identify those investments that can survive a disruptive economic event and maintain their nest egg over the long term. There are a few gems to be found. As I mentioned in my recent article A Perfect-O Dividend Stock for Income Investors, there are dividend investment opportunities with companies that are so strong and reliable that their business was virtually untouched during the Great Recession. Using these techniques I have identified a few income funds that pay regular dividends and preserved investors' capital during the period before and through the Great Recession. Closed end funds J Hancock Premium Dividend Fund (NYSE:PDT) and J Hancock Tax-Advantaged Dividend Fund (NYSE:HTD) delivered the best results over the tumultuous period from January 2006 through June 2016. 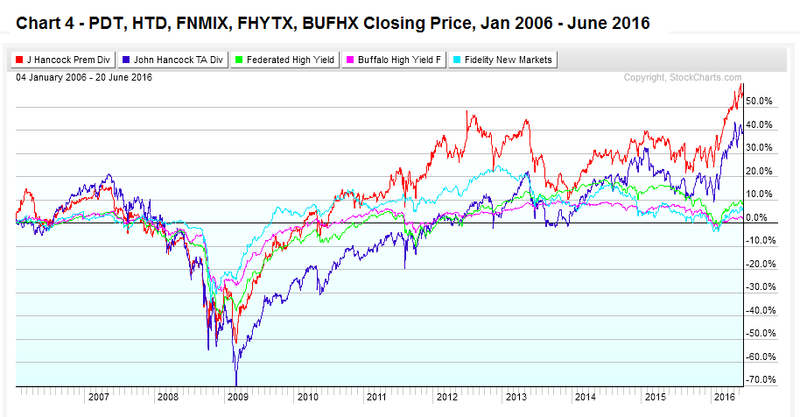 The Fidelity New Markets Income Fund (MUTF:FNMIX), Federated High Yield Trust (MUTF:FHYTX) and Buffalo High Yield Fund (MUTF:BUFHX) also provided investors with reliable high income while preserving their nest egg. 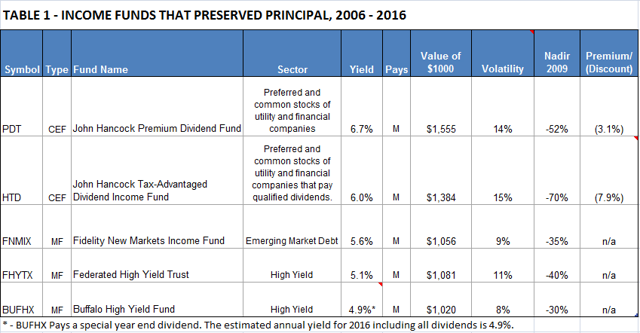 The table shows the value as of June 2016 of $1000 invested in each fund on January 3, 2006. PDT and HTD actually provided modest growth of the original investment over the period, which is very unusual for a high income investment fund. The other funds preserved investors' original investment while providing reliable high income paid monthly. The Volatility column is the standard deviation of the daily closing price as a percentage of the period ending closing price. For comparison, the volatility of the S&P 500 index over the period is 17.1%. The column labeled "Nadir" shows the maximum percentage decline in the closing price of the fund during the market crash of 2007 - 2009. Closed end funds PDT and HTD with their 33% leverage suffered the most severe declines. Investors in close end funds should understand that the leverage they utilize will result in higher volatility. Retirement income investors should always consider whether an investment has proven that it can preserve their precious capital during periods of economic disruption. Achieving that goal requires a solid business strategy executed by competent investment managers. Investors can use price charts that span good times and bad to identify funds that have preserved investment capital. Disclosure: I am/we are long PDT, HTD. I wrote this article myself, and it expresses my own opinions. I am not receiving compensation for it (other than from Seeking Alpha). I have no business relationship with any company whose stock is mentioned in this article.